Unwavering advocate of U.S. leadership in the world, strong national security, free-trade and economic growth. This fifth generation Hoosier is the U.S. Senate’s most senior Republican and longest serving Member of Congress in Indiana history. He was the Republican leader of the Foreign Relations Committee and a member and former chairman of the Agriculture, Nutrition and Forestry Committee. He was first elected to the U.S. Senate in 1976 and won a sixth term in 2006 with 87 percent of the vote, his fourth consecutive victory by a two-thirds majority. Senator Lugar graduated first in his class at both Shortridge High School in Indianapolis and Denison University in Granville, Ohio. He attended Pembroke College at Oxford University as a Rhodes Scholar, studying politics, philosophy and economics. Senator Lugar volunteered for the U.S. Navy in 1957, ultimately serving as an intelligence briefer for Admiral Arleigh Burke, Chief of Naval Operations. Senator Lugar manages his family’s 604-acre Marion County corn, soybean and tree farm. Before entering public life, he helped manage the family’s food machinery manufacturing business in Indianapolis with his brother Tom. As the two-term mayor of Indianapolis (1968-75), he envisioned the unification of the city and surrounding Marion County into one government. Unigov, as Mayor Lugar’s plan was called, set the city on a path of uninterrupted economic growth. He served three terms on the U.S. Advisory Commission on Intergovernmental Relations, including two terms as the Vice-Chair of the Commission, and served as President of the National League of Cities. Senator Lugar has been a leader in reducing the threat of nuclear, chemical and biological weapons. In 1991, he forged a bipartisan partnership with then-Senate Armed Services Chairman, Sam Nunn (D-Ga.), to destroy these weapons of mass destruction in the former Soviet Union. To date, the Nunn-Lugar program has deactivated more than 7,500 nuclear warheads that were once aimed at the United States. 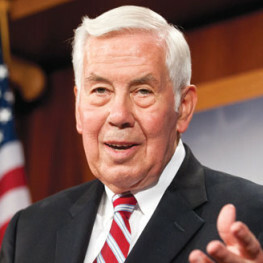 As Chairman of the Agriculture Committee, Senator Lugar built bipartisan support for 1996 federal farm program reforms, ending 1930s era federal production controls. He has promoted broader risk management options for farmers, research advancements, increased export opportunities and higher net farm income. Senator Lugar initiated a biofuels research program to help decrease U.S. dependency on foreign oil. He also led initiatives to streamline the U.S. Department of Agriculture, reform the food stamp program and preserve the federal school lunch program. Combining his experiences on the Foreign Relations and Agriculture Committees and recognizing that energy security impacts every aspect of life in the United States, from the cars we drive and how much we pay at the gas pump to our vulnerability to foreign terrorism and our relationships with other countries, Senator Lugar launched the Lugar Energy Initiative. Senator Lugar has promoted policies that spur economic growth, cut taxes, lead to job creation, eliminate wasteful government spending and reduce bureaucratic red tape for American businesses. His Hoosier commonsense has been recognized many times including such awards as Guardian of Small Business, the Spirit of Enterprise, Watchdog of the Treasury, and 46 honorary degrees from colleges and universities in 15 states and the District of Columbia. He was the fourth person ever named Outstanding Legislator by the American Political Science Association. Richard Lugar and his wife, Charlene, were married September 8, 1956, and have four sons and thirteen grandchildren.